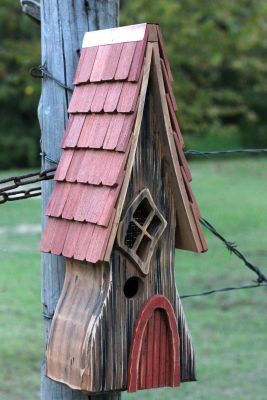 Beautiful Charming Storybook Style Bird House For Your Feathered Friends! This appealing novel creation combines storybook charm with durable construction. Writers from Charles Dickens to Emily Dickenson have spread the word about the wonder of birds, and so will this appealingly novel creation, combining storybook charm with durable cypress construction designed for real-world use year after year. Beautiful rustic design with red shake shingled roof and copper trim. 1-1/2" diameter entrance hole perfect for bluebirds, chickadees, wrens, titmice, nuthatches and other small songbirds. You’ll have a Dickens of a time wondering how you and your birds ever lived without it!